Tungsten TIG electrodes work great for touching up an edge on a blade. I'm still using stones that belonged to my Great Grandfather. If you don't drop them they are pretty much "forever". Does anyone have a stump vice for chain sharpening? I contemplated getting one but haven't seen them advertised in years (may have been in Bailey's catalog). I've stocked up on sharpening stones and have stored them in several different places. These could be indispensible during an apocalyptic event. General sharpening an 800 to 1000 grit deluxe King water stone will last a life time and more. You will run out of oil before you run out of water, so I wash the sluff off the stone with gallons of water, something you can't do with oil. If you are doing a lot of reprofiling, get a 400 grit Naniwa chosera stone. If you need a razor edge, have a 6000 grit or more water stone and finish the edge with brown paper. Late to the party, but part of what I do for a living involves sharpening knives and other edged tools. That means I have north of $2000 in sharpening stones in my big kit, plus assorted other stuff I've kept around after testing it...and that's not counting whatever I have in inventory at the time. For those that don't have the luxury of writing sharpening stones off as business expenses, from my experience the best bang for your buck is going to be Natural Arkansas stones (used with oil, not water or "sharpening solution"). If you're only going to buy one, an 8x2 hard Arkansas will take care of most knives, if you want a hair popping edge, you'll want to add either a black or translucent stone as well (people will debate which is better of the two, I personally prefer translucent). Add in a double sided carborundum stone (Either Norton or Lansky) and you'll be able to efficiently sharpen any knife from dead-dull to shaving sharp. Life is too short to be messing around with the little stones you guys are talking about. Haha....want to race? For a 4in knife, I can go from dulled on a brick to shaving hair off my arm in 2-3 minutes. There are a couple of oil boxes full of coffee mugs in my barn. You can sharpen knives, machetes axes with the bottom of a coffee mug. I also buy old files at garage sales. Often tool sales will have stones real cheap too. Buy a box full of them. Lets make it interesting and do sets of 20" blades with face bevels to change the cutting angle ever so slightly. I have power tools in the shop (Yes, I have bench grinders, belt grinders, wet grinders, sanding mops etc along with more specialized equipment for saw sharpening) but for a simple plain edge knife sharpening its not worth the time it takes to get them set up when I can just use stones, and if I'm sharpening on location, I only take the stones with me. Sharpening stones are one of those things people buy and then realize just how much practice it takes to get good at doing it freehand. I'll admit I'm not all that good at it, but I have several in like new condition i bought cheap at yard sales. Personally I just use a Lansky for my hunting knives and freehand some of my less important knives to get the practice. Eventually I'll get it. I don't normally handle power tool blades for other people.....but I've yet to be given an edge I couldn't sharpen freehand when challenged. Not long ago a buddy of mine gave me a bag of old, mostly unused handplanes so I could do the blades for him. Nasty tools and nasty blades for the most part. Could tell which he actually used most by looking at which were cleanest in the bunch. His goofy pocket plane was one of his favorites but was so small it wouldn't fit in any of my jigs for that sort of stuff. Took me a second to realize what I was looking at there. My personal favorite for a "How am I gonna sharpen this?" item was when I had a customer request that I find him a pair of functional auger bit sets (Both Irwin and Jennings). He didn't mind mismatched sets so I could assemble them from whatever bits I could find and save him a couple bucks instead of hunting down pristine sets. Takes me a couple weeks but I get every size tracked down and set to cleaning them up. Everything was going fine until I got down to the No. 7s and started noticing how little room I had to work with when sharpening...No. 6s work with my skinniest file but just and I'm left staring at the 4s and 5s and an oddball No. 3 scratching my head. Spent maybe 15 minutes digging though drawers hoping to find some oddball super skinny file I had picked up somewhere....no luck. Then I spend maybe another 30 minutes checking websites to see If I can order something in that will work....nothing looks too promising....some stuff should work for the 5s but the 4s were extremely questionable and there was no way with the 3. 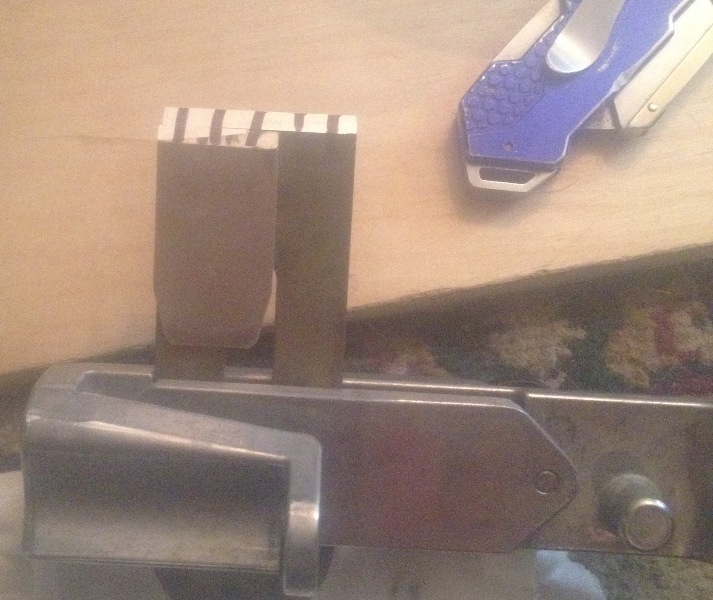 He glued a tiny plane iron to a larger one. I did think about the 'what if' of the glue letting loose and where it might go if it got flung. If I was to do that sort of thing again I would use a lot more than the 3 little drops of glue that I did! The vertical black lines are sharpie marks. They help me when making adjustments so I can see the effects faster and more clearly. The diagonal line across the small blade was throwing me for a loop (grinding much more on the left side and not touching the right) until I marked it and realized that my setting was square and so was the blade. (both blades) Whoever had done that small blade previously did it on a slight angle.